Hi! I’m Merdet and I’m a 2D artist/designer. I became a Puny Human back in November and have since been working on spaceship designs, GUIs, motion graphics, logos, and painting nebulae. It’s been a fantastic ride. 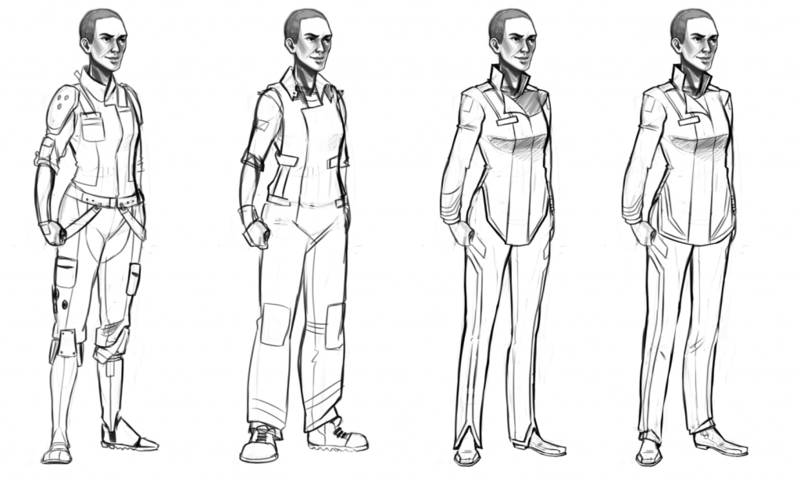 I’m excited to say that, for the past few weeks, I’ve had the chance to do some character design! OH MAN, I love character design! So I’m posting today to show you some recent work and the process behind it. I’ll skip ahead to our third character, Ajax. 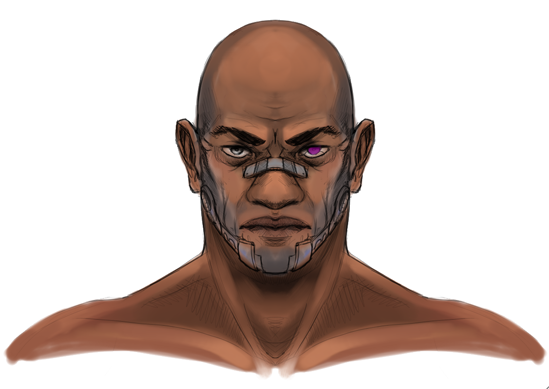 A seasoned military veteran and former mentor to Edrist, Ajax is a silent heavy-hitter with a propensity for great wisdom. His main features are his cybernetic, prosthetic limbs (which was originally going to be an Edrist trait until Urinal Cake and I decided against it). I took a lot of inspiration from a lot of comic book heroes for Ajax: Drax the Destroyer, Captain America’s Falcon, and Cyborg to name a few. These were helpful for deciding where his prosthetic would go and how they would affect his shape. Mechanical designs are not my forte, so this was a fun challenge. I moved to designing his face next. At this point I’ll mention that the third-player color is a warm purple (Silverwolf says it’s hot pink but he’s wrong and he knows it). Here’s mah boy! All polished up and ready to match some bits!